Alan Palmer first trekked in Morocco 25 years ago. This adventure began serendipitously when he jumped aboard a shared taxi outside Bab er Robb, bound for the trailhead town of Asni, simply to escape the August heat of Marrakech. Once there he decided to climb Mt Toubkal, at 13,670 ft the highest mountain in North Africa, and made it to the top wearing nothing on his feet but a pair of flimsy lounge shoes. Since then he has travelled widely in Europe, often combining his trips with work as an archaeologist. He has trekked through some of the most spectacular mountainous regions of the Himalaya, Karakorum and Hindu Kush, and has contributed to two other guidebooks, Pakistan and The Silk Road, both by Insight Guides. Alan returns to Morocco as often as possible and his latest project is to trek the entire length of the spine of the High Atlas Mountains. 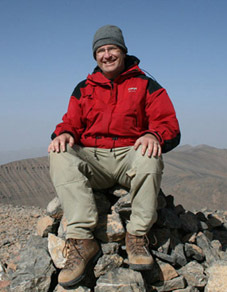 He is a Fellow of the Royal Geographical Society and a member of the British Moroccan Society.